A uniquely peaceful park for adults, based on a garden theme, with pitches set amongst lawns, shrubs and flower beds. 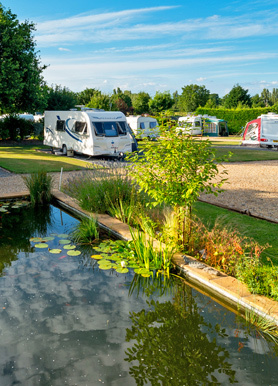 The caravan site is within 800 yards of a championship fishing lake and the surrounding country park is one of the best places in Somerset for bird watchers and walkers. All pitches have electric hook-up. Our luxury heated toilet and shower facilities are refurbished annually. A utility room provides laundry and ironing facilities. Service washes available. The park is close to Bath with its historic Spa and shops. Bristol, Wells and Weston-Super-Mare are within easy reach, so the caravan site is an excellent base for exploring the Mendip Hills and Somerset attractions. Visit our Promotions and Special Offers page to find low season discounts as well as Bath and Somerset promotions. If you'd like to stay with us, but don't yet own a caravan or motorhome, try The Bristol Camper Company who have hire a great selection of camper vans.